Life is the definition we give to it. And so like everything else, failure is the definition you give to it. Failure could be a stepping stone to ones goals if you perceive it to be, it could also be your final bus stop in life if you perceive it to be so. The Bible caps it all when it said, As a man thinks, so is he. Your perception as to what failure is determines how far you can go in life. No man is born to be a failure rather failure is, as Henry Ford puts it, an opportunity to more intelligently start afresh. A man is not a failure because he tried and failed, but because he stopped trying. Ask any great man, and he will tell you how many times he failed before finally hitting the jackpot. Thomas Edison failed so many times while trying to invent what we now know as light bulb, an invention that changed the course of mankind forever. It took him moments of trying and failing before he finally got it right. Our Saviour, Jesus Christ gave us a perfect example when he was being crucified on the cross, as in flesh, he cried out, Father, why have you forsaken me, but on a second pause, still prayed, Father forgive them for they know not what they do. A few moments after that his glorification came, he fulfilled his mission on earth and then received the crown of life from the Almighty.Given the right approach, there are underlying fortunes in failing. 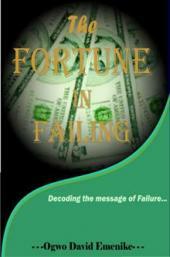 And so in this intriguing book, The Fortune in Failing, the seasoned author expertly explains what failure is all about, the right approach to failure and of course the fortunes embedded in failing. Read on to decode the message of failing which he tried to convey in this book.Maybe you've failed at something and you think its over, that nothing else can be done. This book is a required elixir to gain your confidence back and help you unlock the benefits of failing.A line from Uzoma Ezeson, "The zenith is just a little farther from the nadir." Start to learn from your failure. If your failure is not a lesson, then it is a failure indeed. The book and the author are just awesome.